Assisted living provides seniors with just the right amount of assistance to allow him or her to maintain their independence - all within the comforts of a home-like setting. Assisted living provides a personalized alternative for seniors who need more assistance in their lives, but do not require the full-time attention associated with costly nursing homes or personal in-home care. Long-term care designed to meet the needs of those with Alzheimer’s, dementia and other types of memory-loss conditions in a secure and compassionate environment. We provide assistance with the activities of daily life in safe and beautiful surroundings. Our focus is on what residents can do, rather than what they are no longer able to do. 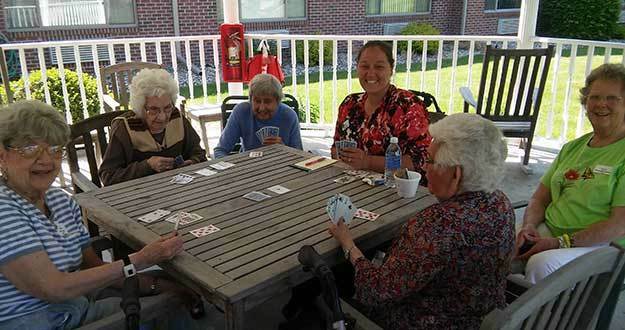 Our planned activities are intended to stimulate and entertain our residents. By incorporating the core values of dignity, respect, choice, independence, comfort and privacy, those in our community feel valued and receive the care they need. What is your move-in process? Prospective resident and/or family visits and tours community. Any medications are brought to the Care Management staff prior to moving in. Each quarter from the resident’s admission date, a Service Plan Conference will be organized. Yes. We encourage continuity in relationships with all healthcare providers and will assist in making appointments and arranging for transportation. If needed, our staff will assist in contacting a new healthcare provider.